While both VPN and proxy can hide your IP address and keep you anonymous, they work in different ways. 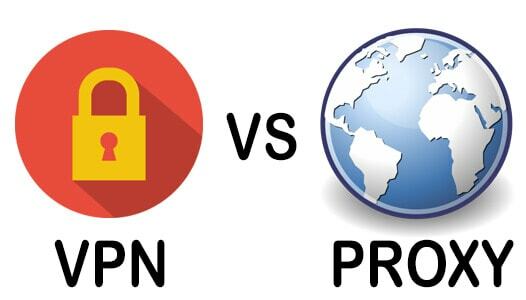 Here is a comparison between VPN vs Proxy. As defined above, a proxy server protects your real IP address. The server controls the target website, and this website is unable to detect your IP address. But, there are cases where servers of particular institutions prevent users from certain websites. These are commonly workplaces that inhibit their employees or workers from browsing prohibited sites. In this case, a proxy server comes in handy allowing you to access the websites you want. Some countries block their citizens from accessing sites that have mature or violent content. A full anonymous proxy server enables you to bypass these filters and freely surf the web. As defined above, a proxy server protects your true IP address. The server controls the target website, and this website is unable to detect your IP address. But, there are cases where servers of particular institutions prevent users from certain websites. These are commonly workplaces that inhibit their employees or workers from browsing prohibited sites. In this case, a proxy server comes in handy allowing you to access the websites you want. Some countries block their citizens from accessing websites that have mature or violent content. A full anonymous proxy server enables you to bypass these filters and freely surf the web. Just as obtaining access to block websites, a proxy server is also used to restrict particular sites to people using the network. If you’re an organization, you can use a proxy server to limit an employee from accessing web pages that can damage your network or reduce their productivity. The level of security is very low if you’re browsing the internet using your real IP. With a proxy acting as an intermediary, you can prevent the risk of being attacked by hackers when browsing the internet. Proxy is the best way to remain anonymous while surfing the web. Unlike the belief that only hackers use proxies to stay anonymous online, many institutions prefer their IP hidden, so their identity remains unknown. An excellent proxy server is used by international companies to show different content to their visitors depending on their geographical location. This will detect the position of the website visitors and load web pages appropriate for their market. Other notable benefits of proxies include compressing traffic allowing you to save bandwidth, cache files to speed up the webpage load time and block malicious websites. Proxies can also strip ads from sites before that can even reach your computer. The cache systems of proxy servers are highly active and very good. In many cases, your browser websites, your passwords, or any secured information can be looked up by your service provider. Therefore, it is a must that you choose a paid or dedicated proxy server provider. Your information or data can be leaked even though you’re using an encrypted network or connection. Refrain from using SSL or TLS encrypted connections. As mentioned earlier, a proxy server can provide help in accessing blocked websites. Therefore, any offensive or blocked sites can be accessed by students or employees reducing their productivity. So, the many advantages of proxies suppress its disadvantages. In any technology, there’s always pros and cons so it depends on you on how you will utilize its benefits. It will never hurt to give it a try on using proxies according to your needs. VPN or Virtual Private Network service protects your web browser. VPN secures 100% of all internet access. It replaces your local ISP routing for every application. An entirely anonymous VPN server allows you to enjoy enhanced security. A VPN server not only protects your torrent downloads but all other online programs and activities such as email, web browser, and third-party applications that use the internet. This also gives you a faster internet connection and high-quality encryption. VPN service is a secure solution allowing users to receive and send data on the internet while maintaining the confidentiality or privacy of the data. This means that VPN unblocked the internet, allowing you to browse the web without any restrictions freely. Here are the advantages of VPN. When you use VPN to connect to the internet, the data is encrypted and secured. This gives you protection against hackers. For businesses or institutions, a VPN network allows them to access data remotely from virtually any place. VPN will enable companies to increase their productivity. With VPN, you can surf the web by remaining completely anonymous. Compared to web proxies or anonymous IP software, VPN service allows you to access both websites and web applications by staying completely anonymous. A VPN service has used an organization that needs to share files or data in a given period. VPNs are perfect for bypassing internet filters and blocked websites. This is the primary reason why there is a massive increase in VPN services in countries that apply internet censorship. VPN can provide you with IP address from another country. The efficiency of network and bandwidth can be improved once a VPN server is implemented. The implementation of a VPN network can significantly reduce maintenance costs. Also, opting for a service provider of a VPN network will take away the concerns for surveillance and network setup. You may have done your research and found some articles about the best VPN service. Although you are aware of the performance and features of these different VPN services, it is a must that you provide a service provider that offers free VPN trial. Here are the things you need to consider or to look forward to when using a free VPN trial. Speed – Does your webpage takes tons of seconds to load when using VPN? It is a must that you look for VPNs that can enhance your internet connectivity and not drag you down. Reliability and Connectivity – Before you buy a VPN service, you must ensure that it guarantees your safety and security without slowing down your connection. The Numbers of Servers – The server numbers is one of the most critical parts when choosing a VPN service. Before you subscribe to a VPN service, you must make sure that your service provider can give you tons of servers across the globe. Compatibility – The VPN server must be compatible with apps in different operating systems. Since you are using more than just one device to surf the web, it is likely that you also have different operating systems. Your VPN service provider must be able to meet your needs by giving you apps that are compatible with various operating systems. Simultaneous Connections – People are always online in more than just one device, so the number of simultaneous connections is significant for better online surfing experience. Not all internet users are tech-savvy, and even the most experienced ones will need support and guidance. A VPN service provider that offers real-time customer support is a must. Choose a VPN that enables you to contact their customer support via email, live chat and support ticket systems. So before you subscribe to VPN service, always check the reviews page. Note that VPN reviews are often based on specific tests and not from actual customers. So, if your VPN provider has its review page, thoroughly check the reviews first before you subscribe. The use of VPN can be considered illegal in your country. Note that there are countries that do not allow their people to use any VPN. VPNs are blocked in nations that deem private networks illegal. If you believe that your county is among the list of countries that consider private network connections illegal, then do not use VPN. Doing this can make you pay for a huge fine or even go to jail if you do it. Using a private network can have performance issues. Note that a private network works by connection a private server to your network before you can access the internet or the website your wan to browse and this can create performance issues in the process. Certain VPNs may take longer to contact the virtual private servers. This means that it will take more time to load the web page or website you want to access. You may notice a decrease in the speed of your internet connection using VPN than regular connection. VPN is relatively easy to set up for individual users. Simply download the VPN software or app and install it on your computer. But, for business, VPN can be challenging to set up. Setting up VPN can be much more complicated in the case of business users, especially when you need to set up a VPN network within your business premise. This demands complexity on your entire network connection and will affect every device that you’re using for your business. Although many VPN companies can simplify this for you, you will still need to have a dedicated team to manage your network to oversee your private business network. In general, a virtual private network is a paid private connection service. This means that you need to pay separate fees from your regular internet service provider or network connection. Also, if you need to add a VPN router, you will have to buy another VPN router hardware to be used alongside with your virtual private connection. Although there are tons of free VPN connections available for you, router hardware does not come free of charge. Note that a VPN connection can become very expensive in the long term. There are the cons of VPN that you must be aware of before subscribing to the service. If you’re planning on using VPN service, you must use a reputable one. Reputable VPN service providers will have very few of these disadvantages. Also, you give emphasis on your online security and privacy, VPN is the best option available to protect your information or data. After reading the benefits and drawbacks of VPN vs proxy, you would probably prefer VPN. VPN like Torguard can offer you same benefits of proxy, except that you will get higher levels of anonymity, protection, and security. The only instance that you would want to use a proxy is when you require a solution for simple tasks such as getting around geographical restrictions and viewing blocked websites.